Gozo is the perfect location for the tourists in search of a quieter place. 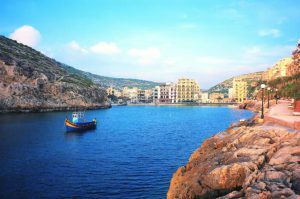 The little 67 square kilometres island kept its rural aspect, reminding to many of what Malta was like in the past. The ferry connection to Malta is very good. There are frequent departures, both day and night, from Cirkewwa, the most Northern tip of Malta. It is also very easy to reach the ferry departing location, by bus, from all the touristic hotspots on Malta. The airport is linked to Cirkewwa by bus, which leaves every 45 minutes, for a €2 fee. The trip lasts up to 1,5 hours, but unfortunately between 22:50 and 5:00 tourists should use the taxi service, for €30 to €35, as the bus does not run in the night. The ferry departs every 30 to 45 minutes through the day, and each hour and a half through the night. The ferry trip is mesmerizing: at the middle of the trip you will be able to spot the Comino Island, with the famous Blue Lagoon and the prison tower, which held prisoner the count of Montecristo, in the Alexandre Dumas novel. Also, look out for dolphins, as you might spot a few following the trail left by the ferry. Once arrived to Gozo, you have many attractions waiting for your visit. One location is Calypso’s cave, known from Homer’s Odyssey, where Ulysses was held hostage for seven years by the nymph Calypso. The UNESCO protected Ggantija temples and the Ras il-Wardija Nymphaeum artificial cave are some must visit locations. The temples have been conceived by the Neolithic population years before the Stonehenge and the pyramid of Giza. The cave is dated back to the times of Phoenicians and it’s considered to be a religious sanctuary. The western part of the island holds the Azure Window beautiful arched rock formation. An important location to visit is the Citadel, which holds many precious gems within its walls.